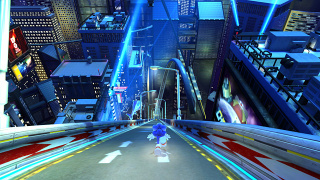 Speed Highway is the fourth stage in Sonic Generations for the PC, PS3, and Xbox 360; revisiting the original Speed Highway of Sonic Adventure. 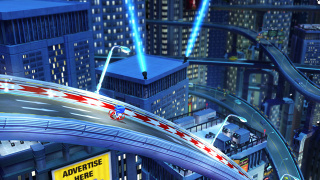 Classic and Modern Sonic are sent back to the nocturnal highways of Station Square, and like the original stage this level is very speed oriented. While Modern Sonic runs along buildings and suspended roads like the original stage, Classic Sonic runs through and between the buildings, speeding up escalators and smashing up a whole bunch of rather expensive hotel property. Grab onto helicopters and rockets to help hop from one building to the next! After classic Sonic defeats the Death Egg Robot, both Classic and Modern Tails start to piece together the time-based shenanigans that must have brought them to this point. Another roaring flyby courtesy of Time Eater sends the Sonics racing after him towards the latest revealed cluster of bleached buildings: Speed Highway. Cream the Rabbit and Cheese the Chao are frozen outside this stage. After they're rescued, the Sonics proceed on to City Escape. Cop Speeder — Police hovercars driven by Baby Kiki monkey-bots, these tenacious vehicles give chase when Sonic is hopping around on top of buildings. Spina - Half helicopter, half bat, half robot, Spina models whirr around in the air serving mostly as homing attack fodder rather than any specific threat. Spana - An electrified version of Spina, the Spana guard with his electric shield, so be careful when using the homing shot or will be a shock. This page was last edited on 5 April 2018, at 15:10.